A few years ago we decided to upgrade our trophies and come up with something special and meaningful that would represent Murphysboro and our contest. We’re fortunate to have award-winning glass artists at the Douglass School Art Place and we commissioned these one-of-a-kind glass apples, in varying sizes, to use for the category runners-up and the reserve grand champion. The Frederick Douglass School was Murphysboro Illinois’s segregated black elementary school from 1897-1966. Purchased in 1993 by art historian Gretel Chapman and glassblower Jan Thomas for development as an art place, “The Doug” offers studios for rent to artists, exhibition and performance spaces, and a developing sculpture garden. The DO U GLASS Hot Shop is housed in the WWII quonset hut which was the school’s cafeteria . Cam and Jan are renowned glass artists and they sell their creations at fairs and festivals all over the region. 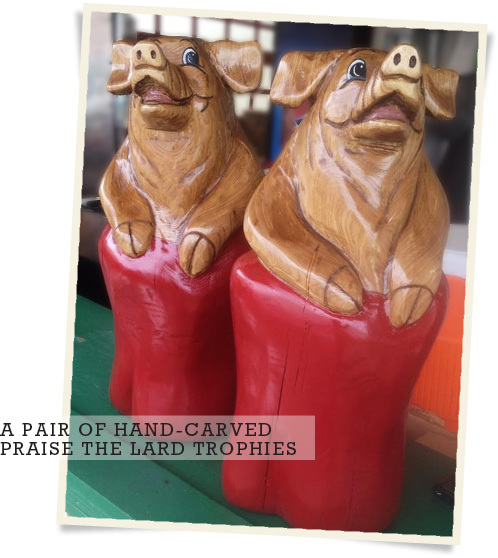 The lucky MBN and KCBS Grand Champions will each take home one of these chainsaw-carved apple and pig trophies, crafted by Bear Tracks Chainsaw Carving. Boars Night Out won one of these several years ago and I saw pictures of this pig, strapped in with a seat belt and wearing sunglasses, riding all over the country in Allen Smith’s truck. Wendy Rhodes and her dad, Mike Rhodes, are a father/daughter carving team. Mike cuts and preps the raw material and Wendy is the artist, finishing each intricate piece. We’re thrilled to have Illinois artists creating these special pieces of art for our contest prizes. We’ll be awarding these trophies starting at 6 p.m. on Saturday, September 20. 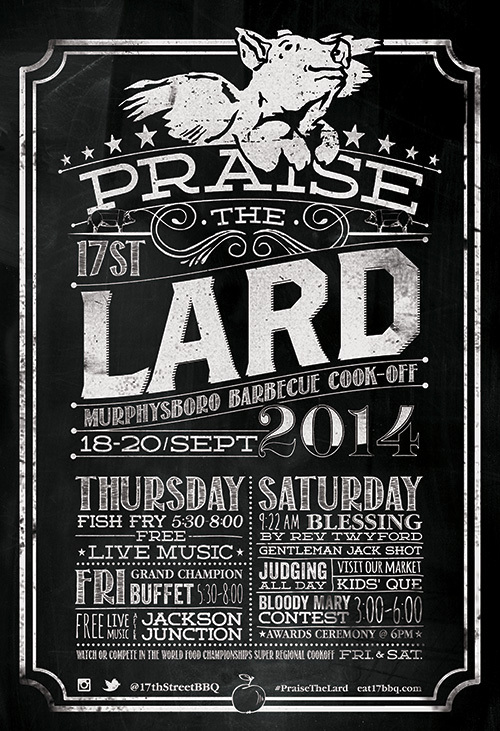 Big fun ahead as teams prepare to roll into Murphysboro for the 27th annual Praise the Lard Murphysboro Barbecue Cook-off. The whole Southern Illinois region comes out to celebrate at the Fish Fry and Grand Champion Buffet, both events followed with music and revelry. The Fish Fry and the Grand Champion Buffet are ticketed events and open to the public. Music after the events is free. Tickets are available in the 17th Street office or at the door. All events take place in and around the 17th Street Warehouse. The best address to use for GPS directions is 214 N. 17th Street, Murphysboro, Illinois. Entry to the contest grounds, Market vendor area, and all live music is free. A variety of vendors will make up our Market area this year. You can browse and buy wood and fresh herbs from Lipe Orchards, kettle corn and lemon shakeups, Bling it On custom shirts and jewelry, Jen’s Joe coffee, jewelry, La Unica Mexican bakery pastries, One Hot Cookies, and Silpada sterling jewelry. Home cooks and regional chefs are invited to enter the World Food Championships. Click on the link for registration information. We also need people to pack the bleachers and watch the fun as the contestants battle in the Kenmore kitchen arena. The categories are bacon and seafood and the winner in each category will win $1,000. The top three in each category win a Golden Ticket to compete at the national event in Las Vegas in November. Local friends and competitors alike can enter the Brews Brothers Taproom Bloody Mary Contest. Visit Brews Brothers or 17th Street for an application. You’ll provide a gallon of your favorite Bloody Mary recipe and everyone 21 years of age or older is invited to sample the entries and cast a vote to help determine the winner. 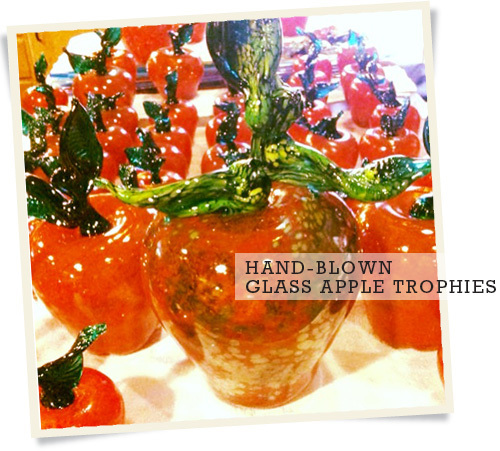 Winner takes all entry fees as prize money, as well as a blown-glass apple trophy. The Townsend Spice & Supply Kids’ Que was a resounding success last year and there are still a few spots left. We’ll provide the meat, a t-shirt, and a grill to take home. Click here for an application or you can pick one up at the 17th Street office. We’ll have lots of cook-off items for sale, including this year’s t-shirt, featuring the artwork in the poster. Designed by Matt Price of Arthur Agency and printed by Silkworm, Ink, this year’s design is getting rave reviews. Get yours before they’re gone! We’ll also have posters, collectible enamel hat pins, and a variety of hats, t-shirts and other items. Please note that due to health department regulations, the teams cannot sell their food. They’re here strictly to cook food for the contest itself. We’ll have an outdoor barbecue and beer tent, as well as other vendors selling various merchandise. We’re known for our warm welcome and gracious hospitality and the teams do love meeting people and chatting about barbecue. Please come out and extend a warm Southern Illinois welcome!